An action game in which bird-mounted knights fly around and battle in a single-screen arena. Controls are simple - the only buttons are left, right, and flap - though the physics take some getting used to. Fighting is accomplished just by colliding with another knight, with the victor being the one who’s higher up. Enemy knights drop eggs when defeated which must be collected quickly or they will hatch into new knights. Defeat waves of knights while avoiding the few stage hazards (mostly the lava at the bottom) to rack up points. The game can be played with one or two players (making Joust one of the first notable co-op arcade games). It’s up to the players to decide whether to cooperate and see how many waves they can get through by working together, to compete on score by killing more enemies than the other player, or to attack each other directly - though some waves reward score bonuses for in-fighting while others reward peaceful cooperation. 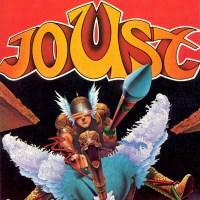 Joust was a hit in the arcades, has influenced many games, and has received numerous ports, remakes, and adaptations. The simple controls are easy to learn while the flying physics are difficult to master, creating a high skill ceiling where improvement is satisfying as you can execute some really graceful manuevers once you know what you’re doing. The flexibility of the multiplayer keeps things fresh if you have someone to play with. Joust is the reason I play games. My older brother tried to get me to play with him on his Nintendo, but taking turns in Super Mario Bros. got old fast since his turns lasted so much longer than mine. With Joust , we could actually play together and affect each other directly, and that was fun enough to lure me away from playing in the backyard. I Stopped Playing When: My brother and I eventually moved on to other games like Bubble Bobble and River City Ransom , but I’ve always had a special place in my heart for Joust .